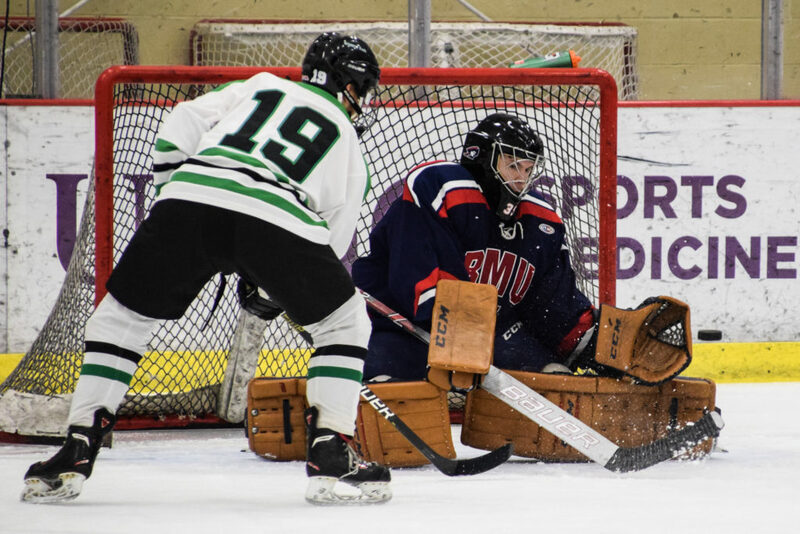 CRANBERRY Twp, PA — The Slippery Rock Pride outdueled the Robert Morris Colonials, 4-2, at the UPMC Lemeuix Sports Complex Friday night. After ending the first half of the season with a 4-0 loss to IUP on December 7, the Slippery Rock Pride bested the Colonials at the Island Sports Center on December 8, 3-2, on a game-winning overtime goal by Antonio Esposito. The rematch featured two teams that were not afraid to be physical and retaliate against one another. During the course of the game, there were three occasions that featured 4-on-4 hockey. There was almost another, just six minutes into the game, when John Seibert and Stefan Krupski got called for roughing minors for the Pride and Colonials, respectively. A cross checking minor by Paxton Knupp at the same time put Slippery Rock on their first power play of the game. Just as the Colonials killed that penalty, another 4-on-4 opportunity was in place just seconds later. That one ended with the same result – a scoreless tie. Connor Ackerman took a tripping minor towards the end of the period for Slippery Rock and the Colonials cashed in on the power play, breaking the scoreless tie to take a 1-0 lead. Ackerman then gave Robert Morris another power play opportunity after getting out of the box, being sent back in for roughing. The Pride killed that penalty then went on their own power play as time expired on the first period after the Colonials’ Joseph Zottola Jr was called for roughing. Slippery Rock took advantage of the man advantage to open the second period by tying the game on a goal by Thomas Kimmick. It was Kimmick’s 100th career goal, and certainly one he would not soon forget as he tossed the puck to his coach for safe keeping. While the first period featured eight penalties, the second had only one, an elbowing call on Slippery Rock forward Karson Frisk. The Pride killed the penalty and then took a 2-1 lead after Nate Mettenburg put one past Robert Morris goaltender Lewis Richardson. In the third, the Colonials tied the game just over four minutes in, with Zottola sneaking a puck past Pride goaltender Kevin Belanger. Slippery Rock took the lead back 22 seconds later, courtesy of Jamie Mauro. Ackerman, who had three penalties for the Pride, redeemed himself with the insurance goal just over halfway through the period that would let his team cruise the rest of the way to the 4-2 victory, sweeping the Colonials on the season. Robert Morris goaltender Lewis Richardson saved 26 out of 30 shots, while his counterpart Kevin Balanger saved 33 out of 35 for the Pride. To see more coverage from Edward you can follow him on Instagram, Facebook, or Twitter. As always, full galleries can be viewed on his website. The conference standings had a chance to see big changes over the course of the weekend before two conference games were postponed due to severe winter weather, or rather the threat thereof. The RMU-Mercyhurst and John Carroll-Slippery Rock games will most likely be rescheduled given their nature as conference games and the playoff implications those games could have by the end of the season. Slippery Rock managed to pull into a tie for second place in the CHMA with Duquesne, the latter holding the head-to-head tiebreaker due to strength of victory (the Dukes defeated the Pride by two goals in early November and the Pride defeated the Dukes a week later by a single goal). IUP still holds the top spot with a game in hand on both aforementioned foes. Pitt and Robert Morris each have nine points (the Panthers hold the tiebreaker with their victory over the Colonials in December with a game yet to play) and Mercyhurst holds the final playoff spot with 6 points. John Carroll and West Virginia each have 4 points and sit on the outside looking in to the playoff race. The Mountaineers are currently winless in conference play. Check out the ACHA schedule here for upcoming ACHA games.